Free Drama & Performing Arts Workshops for children aged 6+. Free to Act is an innovative project which provides a space where young people can come and refine their skills and showcase them through theatre performances. The Free to Act group specialises in bringing out the hidden potential within young people – giving young people the freedom to step out of their shells and act upon their creative thoughts, dynamic ideas & social themes which influence their lives. The group welcomes young people of all abilities and skill sets. Elephant Club is FREE to join and for ages 6-10. For more information please contact Louise on 020 7701 0100 or louise@blueelephanttheatre.co.uk. You can also download and complete the Free to Act Sign Up Form and email it to Louise. 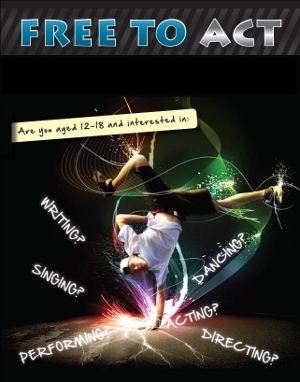 Free to Act is FREE to join and for ages 7 - 11. For more information, please contact Louise on 020 7701 0100 or louise@blueelephanttheatre.co.uk. You can also download and complete the Free to Act Sign Up Form and send it to her.